If you do not wish to vote at this time, click here to visit Division Of Life stats. 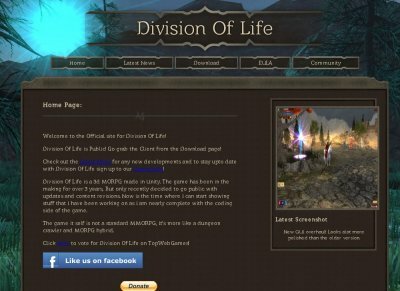 Division Of Life is a 3d MORPG made in Unity. The game has been in the making for over 3 years, But only recently decided to go public with updates and content revisions. Now is the time where I can start showing stuff that I have been working on as I am nearly complete with the coding side of the game. The game it self is not a standard MMORPG, It's more like a dungeon crawler and MORPG hybrid.